This translation software lets you read websites in your own language. It translates each webpage automatically while you browse the Internet. Until now, English was the unofficial language of the Internet. Sure, a few large companies could afford to translate their websites. But by and large, web users were confined to using only sites written in their own language. Web Translator changes all that. For example, with our translation software installed, an employee of a multinational who lives in Spain can use the English to Spanish translator and Spanish to English translator to keep up with in-house news on his company's English-only intranet. 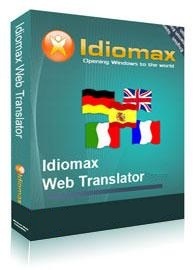 He simply activates the IdiomaX translation toolbar on his IE or Firefox browser. It quickly translates the webpages he opens without changing their original format... the layout, links and images remain the same. Whether you use Web Translator for work, school or personal web browsing, your Internet experience can now be truly international. A translation toolbar is added to your Internet Explorer or Firefox browser. It translates the active webpage, preserving links and formatting. Languages translated include: English, Spanish, Italian, French, and German. Customize your web translator by modifying the provided translations and saving those changes to the built-in dictionary. Search words and phrases, conjugate verbs in different languages as you browse. Select specialized dictionaries before translation (see list below).